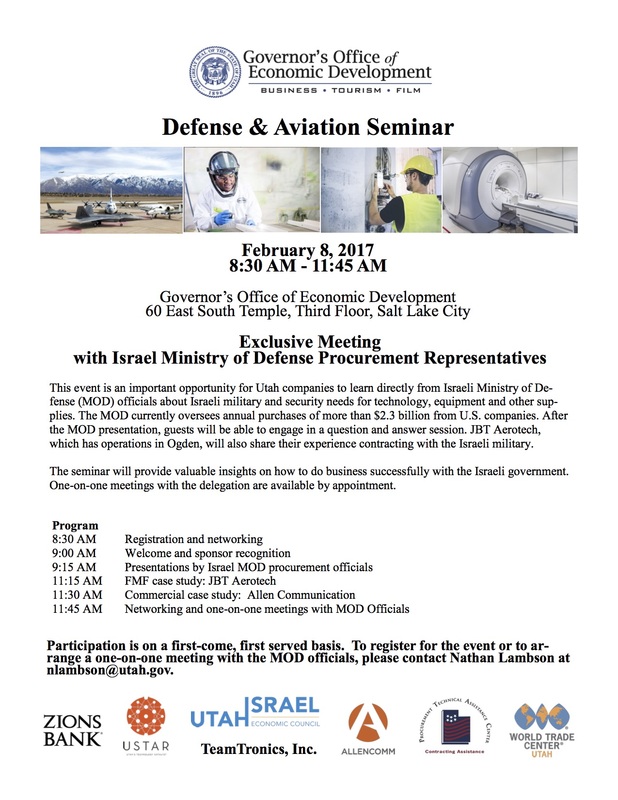 On February 8th, the Governor’s Office of Economic Development’s (GOED) International Trade & Diplomacy Office, the Utah Israel Economic Council (UIEC), PTAC and other organizations are holding a Seminar with the Israel Minister of Defense Procurement Representatives. The event is focused on Utah companies who have experience or would like to become more involved in commercial contracts with defense oriented organizations. This invitation is for individuals that are interested in doing business with Israel and because of the unique nature of this opportunity we welcome you to share it with others that would have such an interest. Space is limited, please see the flyer attached below for RSVP information.